Denver local and contestant on season 20 of ‘The Bachelor’, Ben Higgins was joined by a film crew from NBC’s hit show ‘1st Look’ last week as they took to the streets on a quest to find the best food, nightlife, and adventure the city offers. 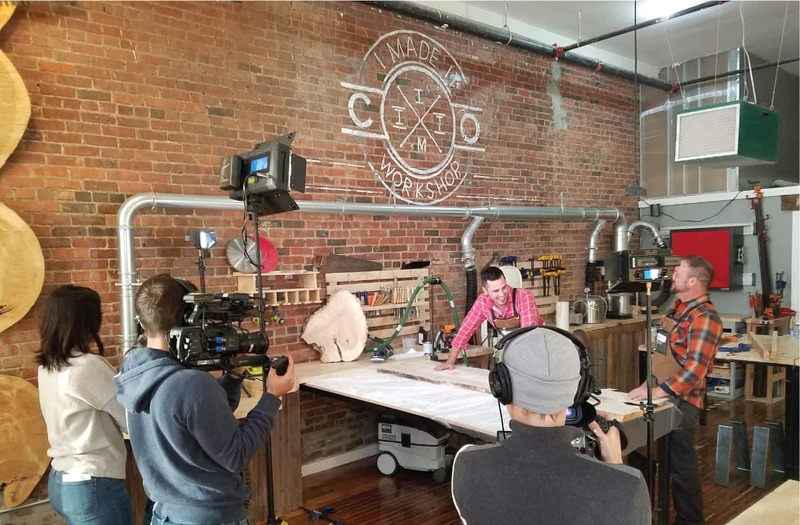 The special airs January 21st and will feature Ben’s visit to I Made It Workshop; where he got hands-on with the woodworking process engaging in the ‘forest to table experience’ every step of the way. The film crew followed Higgins as he met owner, Francis Eggelton, northwest of Denver to source the wood for the project. The tree harvested needed to be cut down for fire mitigation purposes. Back in the shop, Ben is guided through the basics of the project. Woodworking is a fun hands on experience, I Made It Workshop’s instructors guide clients through all the major processes from planning, joining, sanding, resin and varnish to finish off a one of a kind project. Whether it’s a live edge table, cutting board, resin cheese board, rustic picture frame or something you think up on your own, I Made it Workshop is the place to do it. 1st Look will air Saturday night (1/20) on NBC after Saturday Night Live. Located at 22nd and Welton in Denver, I Made It Workshop is a DIY studio that offers material, equipment, and instruction for beginners interested in woodworking and craft projects. Customers can choose a class to learn in, from a menu of designs or bring in custom project ideas. The workshop also hosts social gatherings and corporate events. The wood provided on site ethically sourced and harvested from Denver and the Front Range including the Black Forest Burn scar.